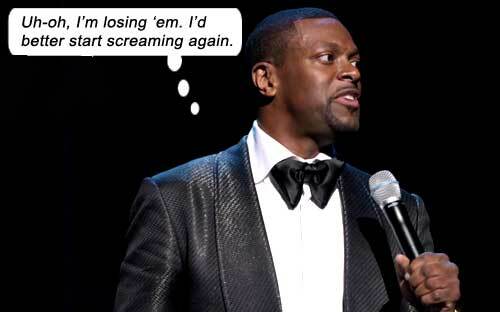 From his hometown of Atlanta Georgia, filmed at the 4,600-capacity Fox Theater in November 2014, Chris Tucker regales us with the type of comedy that would be heckled unforgivingly in smaller clubs. It’s CHRIS TUCKER LIVE. I think. Knowing that comics like Carlin and Hicks and Pryor existed, and knowing current voices like observational powerhouse Louis CK and sociological jungle cat Chris Rock still prowl the comedyways, watching this watery, derivative, unfunny performance by a comedian who showed great promise in his youth, is… disappointing. Tucker’s opening, where he notes the difference in your partner’s attitude before and after marriage (i.e. before marriage, they’ll fix you a sandwich without question, after marriage, they’ll snap at you to fix it yourself), is so beaten to death by the comedy community in general that it is exhausting trying to eke out a smile let alone a laugh. If this is the opening, how weak is the show? Our answer would come immediately, as the ballroom-attired Tucker starts describing his girlfriend taking him rollerblading. Uh… really? Like we care. Distributed by Netflix, written and produced by Tucker, and directed by Phil Joanou (GRIDIRON GANG), the rest of this 90-minute show is as beige as the opening clunkers. Is it irony or tragedy that a comic’s first Stand Up Special arrives when he’s not funny anymore? There’s an extended “Michael Jackson” segment where Tucker recounts his adventures hanging with The King of Pop and filming You Rock My World. Though there are funny snippets, Tucker has to end this segment importuning his audience, “Give yourselves a big hand!” – because the end of that segment was so weak he didn’t get enough applause to establish it as an ending! I can’t believe the director left this in. Besides his childhood anecdotes, all sprinkled with intermittent high-pitched shouting (which worked when he was younger, but in this older, more sedate context, seem like desperate exclamation points in lieu of punchlines), Tucker does a passable Clinton and a terrible Obama. Even when he dips into political personalities, it is shallow impersonation guff, nothing biting, insightful or politically challenging. Tucker’s only 44 though, and maybe it’s a case of too rich too quickly, or maybe it’s a case of From Rags To Riches and Not Wanting to Lose It so Dumbing It Down Fo’ Massuh, in order to stay on top.